Well, the TAGAP Day goodies, of course! Not only did I have to record and put together the footage, but I also had to re-do our website's TAGAP 3 section for the occasion. In the past we had just a bunch of screenshots and two videos, but with more content that layout no longer worked, so now the site has a proper TAGAP 3 section, ready for future expansions. Beyond the trailer work, I've been on a vacation from my (paid) job, so I've been able to work on TAGAP 3 full-time. I split my duties to three fronts; Crafting more cinematics, finishing the last of the space-penguin church levels and creating the missing sound effects. First off, the cinematics; The particular one I've been working on basically forms the basis for what could be called the 'standard intermission cut-scene'. None of these are the same, sure, but they share the same basic elements, so I've been working on those. One particular shared element – a large landscape shot showcasing the atmosphere domes of Pluto from the outside – is something I've spent ludicrous hours on, but hey, now it looks cool and detailed! The space penguin church level I've been working on is almost ready; I've been going through the monster placement passes and event scripting, fine-tuning things with each playthrough. There are plenty of cool scripted gags in this one, but I won't say more about it – I don't want to spoil the funny moments! I can say that while the level is –as I mentioned in the previous post – very Castlevania in structure, the way it is populated and scripted lessens that vibe a bit. And finally, the sound effects. Now that I've finally settled with Sony Sound Forge Pro as my audio editing suite, I've been able to go through the sound effect to-do-list quite fast. Sadly not all of these new, properly fitting sound effects made it in by the trailer recording, so there are few stand-ins from TAGAPs past you can hear in the video. Not many, granted, but a few. One of the things that bugged me the most about the TAGAP 3 début trailer was that we weren't able to make it 1080p and 60 FPS. The reason why weren't able to go beyond 720p and 30 FPS turned out to be the hard-drive we recorded the game to; It couldn't keep up with the amount of data dumped on it. So, this time we used my new computer (with 16 gigabytes of memory) and recorded everything on it's brand new SSD. The result? 1080p60! There are a couple of very minor stutters throughout the video and most of them have to do with the way FRAPS, the capture software we used, records things; It splits the video into manageable 4 gigabyte chunks. All you need to do in your video editor then is to smack these files back-to-back on your editing timeline. This is otherwise fine, but there are some minor stutters – mainly on audio track – at the clip transitions. It's something you might not even notice, but I feel it's my duty to mention these. 0:00 – We start with the classic 'Never Rated' splash screen. Because the game will never be age-rated unless someone else pays for it. 0:03 – Alpha version disclaimer is something we felt the trailer needed. While majority of the stuff you see is guaranteed final, some (minor) stuff will still change. Especially the voiceovers definitely will be changed; We just always save the recording of those very late in the production so that we know for sure what kind of grunts and 'audible emoticons' we need. 0:16 – Gameplay begins, showcasing our new, semi-minimalistic HUD and level title card. Also, the brand new song, "Electromagnetic Boogie", kicks in! 0:22 – Yay! Six seconds into the actual gameplay and we already get our first glimpse of a new enemy; BoomBug. Covered in impenetrable armour and armed with a chaingun, these are basically Pluto's answer to the robot scorpions of TAGAP2. 0:34 – Scrapgun in action. The idea for the weapon was to have a gun that utilizes the amount of collateral damage you cause, using the resulting debris as ammo. What we got is a gun that could almost be called a semi-melee weapon; It does huge damage at close range, but gets progressively more ineffective further away you are. 0:38 – Combo rewards are back. While the sound effect is a TAGAP2 stand-in and will change, this moment illustrates how the pill system has changed. You don't have to eat them right away – instead you can carry up to five at once, using them whenever you need to. 0:56 – Nanogrinder! This weapon uses nanites to break the targets on an atomic level, basically resulting in Disintegrator Mark II. 1:00 – Another new enemy, Cyber-Funky! 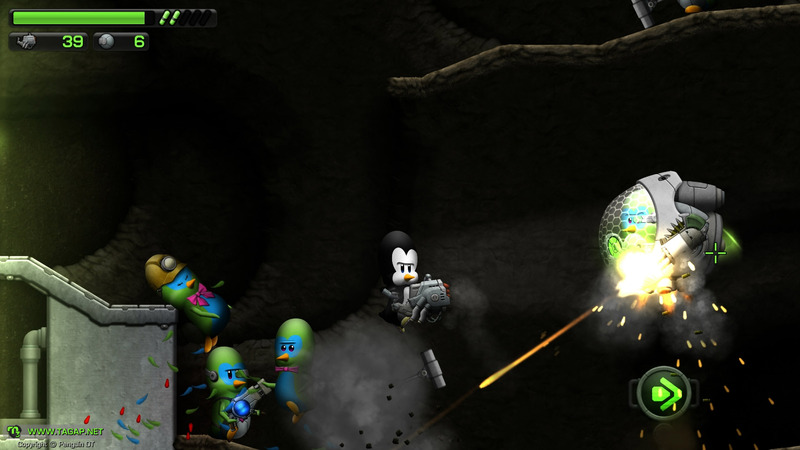 These are cybernetically enhanced funky penguins that can wield heavier weapons and take a tons of more damage. They also have a weakpoint – I wonder what that might be? Also; Yes, I admit it, the visual inspiration comes from the retro Cyber Controllers of classic Doctor Who. 1:21 – Blink and you'll miss it; No longer will the basic melee penguins just magically damage you if you touch them. Thanks to the parametric skeletal animation system they can actually be seen (and heard) to attack you! A minor detail, but it livens up the combat considerably. 1:36 – If you thought the minichoppers of old TAGAPs were bad, you haven't met our new space pods yet. Think minichoppers that are armed with DUAL chainguns and can boost around with afterburners. 'Ouch!' indeed! 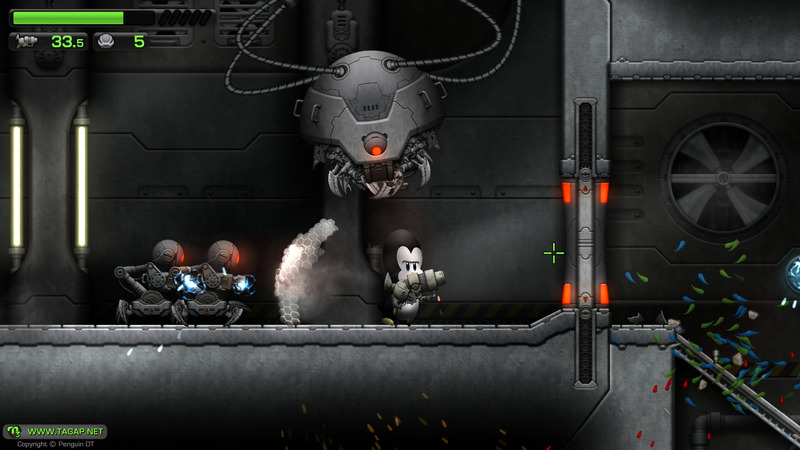 1:43 – Nanogrinder is a complex weapon to handle, as there is a lot more to it than just 'shoot-and-frag'. You see, it does varying degrees of damage depending on what you are shooting; It does less damage to non-organic targets, normal damage to organic ones and extra-damage to anything made of nano-glass. In this case, the cockpit of the space pod is nano-glass, making Nanogrinder a great choice! 2:10 – The trailer has been so action packed, that this is the first moment you'll hear – albeit briefly – the dynamic soundtrack in action. Calmer moments call for calmer music, after all. Yes, this basically means TAGAP 3 has soundtrack twice as big as before, most songs coming in both 'action' and 'calm' variants. 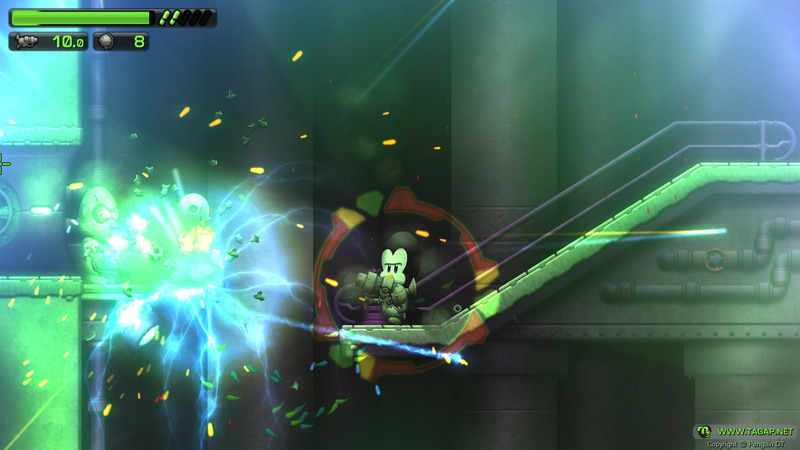 2:15 –While Cryogun can be used to freeze enemies, you can freeze the ground, too; Normal walking enemies will have a hard time slipping on ice, making it an effective crowd control measure. Just remember that you, too, slip on ice. 2:22 – You've likely noticed by now that Pablo is at this point wearing boots that occasionally glow. Well, these are an item acquired fairly early in the game, enabling gravity-defying instant stomps and triple jumping. 2:26 – Overdose is back and you can enter it almost at any time, as long as you have at least two pills at hand. Just double tap the 'take a pill' button for an instant awesome slo-mo. The classic way of boosting health over the maximum works, too. And the enemy, by the way, is our new Penguinator. Yes, we beefed it up quite a bit! 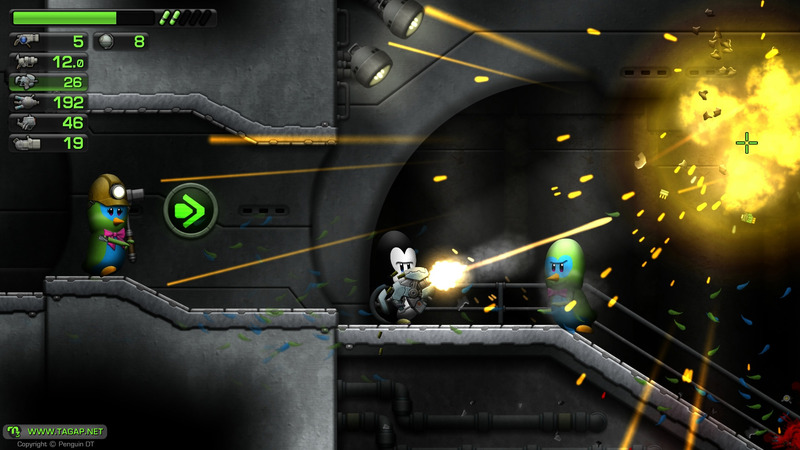 2:29 – Smartgun can lock onto enemies, making the bullets home to their targets. This means that you can concentrate on dodging the bullets without the need of keeping track of enemies and their weakpoints. And yes, this weapon is inspired directly by That Gun from the Fifth Element. 3:09 – Meet our new rocket launcher; MIRV. It fires missiles loaded three independently homing rockets. While one of these rockets doesn't do nearly as much damage as the classic rocket launcher, the combined blast of all three is devastating. 3:19 – 100 frags scored – which means our frag rewards are in! First up is Overdose, which is exactly what the name implies; Instant, extended overdose PLUS a power-up aura granting you regenerating health. Normally health works like before – you can regenerate small portion of your health if you are in really bad shape – but with Overdose you can regenerate the health all the way back to maximum. 3:46 – Battle with the previously-introduced Longlegs bot calls for new gadgets. As you likely notice, at this point I switch my secondary weapon – yes, you can do that now – to shock grenades. These do a lot less damage, but release a huge electronic burst, shocking organic targets and 'EMP-ing' most robots. 4:57 – ...and I can't really complain about our cool electricity effects either! 5:36 – Yeah, this is one of those moments that kinda gives it away that I spent this day replaying this darn level, to the point I actually knew beforehand that a Longlegs was waiting for me down this path. Funnily enough, this is pretty much the only such (obvious) moment in the reel. Anyways, sorry about that. 6:11 – A nice 'calm before the storm' moment created with the dynamic soundtrack. A simple yet effective trick that works wonders, mainly thanks to Petja's compositions that blend so nicely together. 6:19 – Introduction of the new Turret Dropper! Apart from the obvious 'let's make it run along the ceiling!' motif, this is basically how I originally envisioned the monster for the first TAGAP, but wasn't able to execute because of the limited animation systems of the engine; Instead of teleporting the turrets in, I wanted it to assemble them on the fly! Now it does just that, and the result is justifiably creepy enemy. 6:21 – Another secondary weapon; Nanoshields. Yes, these are pretty much the plasma shields that were part of the old Plasmagun, only now they are a secondary weapon and made of the nano-glass. The reason we went this route was simple; Plasma shields were fun, but made Plasmagun pretty OP, encouraging sticking to it. Now there is no such excuse, as you can use them with any weapon you want! 7:02 – See all that debris on the ground? That can be picked up as ammo for the Scrapgun. This means that while fighting enemies like the Turret Droppers are an ordeal, you'll be rewarded with tons of ammo after the battle is over. 7:18 – The exit is open! Time for the mellow atmosphere music! 7:52 – Didn't think we'd let you just idly mosey your way to the exit, now did you? 8:19 – Made it! Time for the next level in this episode – or in case of this video, the end splash screens. 8:26 – Our title screen, as cool as ever! 8:29 – We have no date set, so this is what we are rolling with right now. Sorry. But think positive; At least it isn't 20XX! 8:34 – ...and that's a wrap! Time to push that Replay button, eh? And that's it for now. Have an awesome TAGAP Day 2015!